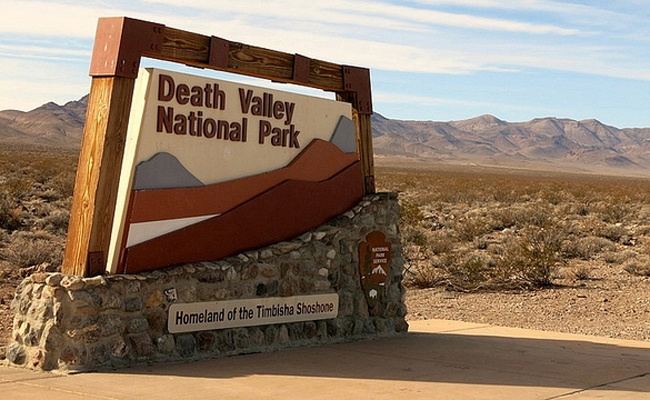 Death Valley is knows for a lot of things. Given its morbid moniker by 19th-century gold prospectors who lost colleagues there when heading west, the area has the lowest elevation in North America. The national park is one of the country’s driest places, and it boasts the highest official recorded temperature on the planet (134°F on July 10, 1913). What it is not known for, however, is lakes – which is why the recent appearance of one is so notable. On March 7, photographer Elliott McGucken started on his way to Badwater Basin, hoping to photograph vestiges of the recent rains. Due to the flooding though, he was unable to get far … and instead stumbled upon the massive, pop-up lake near Salt Creek. The images show the lake with the Panamint Range and snow-capped Telescope Peak reflected in the water. SF Gate explains that the lake came by way of a storm packed with tropical moisture that soaked Southern California, triggering floods on several of the park’s roads. Park employees say that a lake this large in this location is rare. And no wonder: Usually the Furnace Creek rain gauge sees a scant 0.3 inches of rain for the entire month of March. In a mere 24 hours last week, the gauge recorded 0.84 inches – while the surrounding mountains saw up to 1.5 inches. So what other tricks might the world’s hottest place have up its sleeve? The National Park Service provides a hint. “In this below-sea-level basin, steady drought and record summer heat make Death Valley a land of extremes. Yet, each extreme has a striking contrast. Towering peaks are frosted with winter snow. Rare rainstorms bring vast fields of wildflowers…” Superbloom, anyone? Nature is astonishing, there are so many unexpected developments to make us stop & think. I hope the extra water will be good for the desert plants. Iâm sure thereâs some little creatures very happy now.